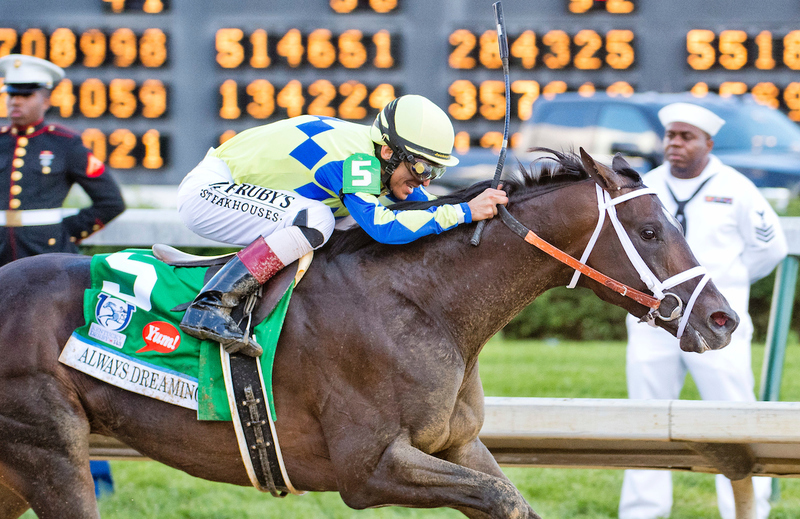 Home / Kentucky Derby 2017 / Always Dreaming Tops Kentucky Derby 2017 – Results! EDIT – WOW! the response from KY Derby winners has been so exciting! 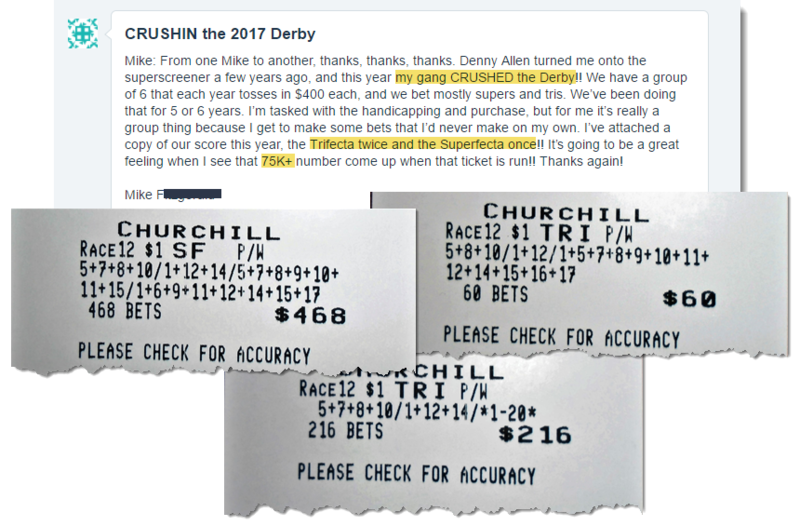 Check out these Super Screener readers who CASHED on the Derby! 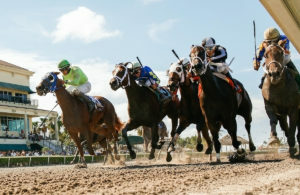 There was some hope about mid-card that the skies would clear and the rain would stop, but just before the running of the Kentucky Derby, the wind and rain returned turning the track once again to sloppy. Always Dreaming, a top Super Screener win contender, broke well and got the perfect trip close to the rail throughout and every horse that tried to challenge him at any point during the journey backed up through field without a prayer. This is a really, really good horse and reports are he was loaded with energy the next day. This is the 5th year in a row now that the post time favorite has won the race, but two long shots finished 2nd and 3rd to produce some nice Exotics payoffs. Irish War Cry created havoc when his jock jerked him sharply to the left as they exited the gate causing a chain reaction over several horses coming out of the 10 to 16 gates. Classic Empire suffered the worst of it getting really clobbered losing a lot of ground and Leparoux had no options but to come wide for a late rally which resulted in the 4th place finish and one could argue he really could have been easily second with a better trip. On the other hand, #1 Lookin At Lee, a Super Screener top long shot bomber pick, got the perfect uninterrupted rail trip saving all kinds of ground and scooting up for a good looking second place finish at delicious odds of 33-1. 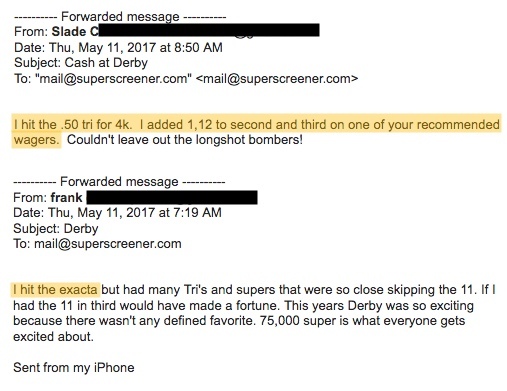 Throughout the final weeks leading up to the Derby, Battle of Midway, was one of the top long shot bomber candidates and he was featured in our Derby long shot video. Works leading up to the Derby weren’t that great, however, and both the track conditions and concerns with running close to the contested pace that indeed did materialize had the Screener going with Sonneteer and Lookin At Lee as our final top long shot picks with Battle of Midway landing as our top “C” horse. Sure hope you used him more “under” in your wagers as he ran the race of his life finishing a really good 3rd holding off the late closing Classic Empire at odds of 40-1. 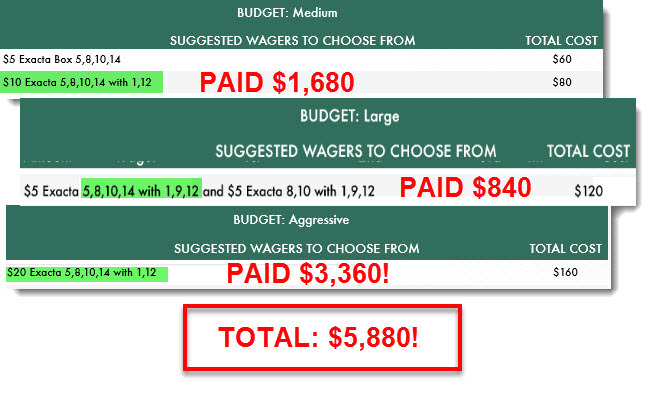 The Exacta wagers in each budget level did connect on the 9-2 over 33-1 Exacta for just over $5,800. 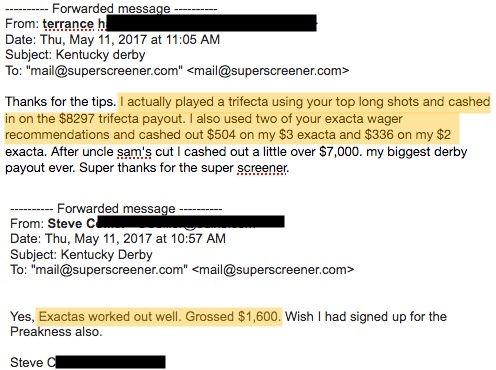 Had Classic Empire, with a clean trip, finished 2nd or 3rd, a big batch of those suggested Trifecta wagers would have clicked. Did YOU Cash? Let us know! Irap – Started short-striding like when a horse is taking a lot of kick back in the face. Well, it doesn’t appear that many runners from the Derby field want to take Always Dreaming on in the Preakness. Lookin At Lee is probable and Classic Empire, Tapwrit and Gunnevera are all possible. New shooters include Royal Mo. 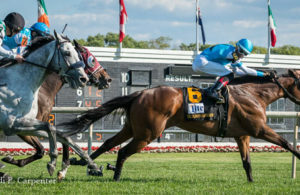 Even if the field comes up short we’ll be covering it end to end and we’ll be including highly playable under card races featured on Preakness Day. Can’t thank you enough for subscribing to the Super Screener and we look forward to isolating more of those key long shots that hit the board and do that all year long. 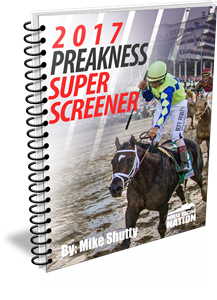 Get the Preakness Super Screener Now! 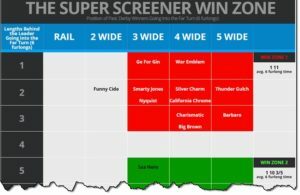 ← Previous Story Kentucky Derby 2017 – Who Will Hit The WIN ZONE? Awesome Information Thanks! Hit Trifecta I think sign up already for Preakness and Belmont!